Gangtok: Over 80 people, including tourists, who were stranded in North Sikkim due to incessant rains and landslides, were airlifted by the armed forces Monday, district administration officials said. A total of 84 people, including tourists and locals, were airlifted by helicopters. Forty two people were flown from Chungtang to Gangtok, 22 from Chungthang to Bagdogra, 11 from Mangan to Gangtok, two from Chaten to Gangtok and seven people from Mangan to Chungthang, they said. Five helicopters did the sorties from 6.30 am to airlift the stranded people and the whole operation was carried out by the 112 Mountain Brigade of the Indian Army posted in North Sikkim and the Indian Air Force. On Sunday, over 100 tourists, including a pregnant woman, stranded in North Sikkim due to incessant rains and landslides, were evacuated by the armed forces. The relief and restoration work has started in a war footing in North Sikkim district as the rains had stopped, they said. The Energy and Power department has finished the task of restoration of the damaged electricity connections in the district, they said. The water supply to most parts of the district headquarters town of Mangan has been restored by the PHED Monday. The Quick Response Team and the Forest department has cleared all the blocked roads in Mangan town and other areas, along the North Sikkim highway. 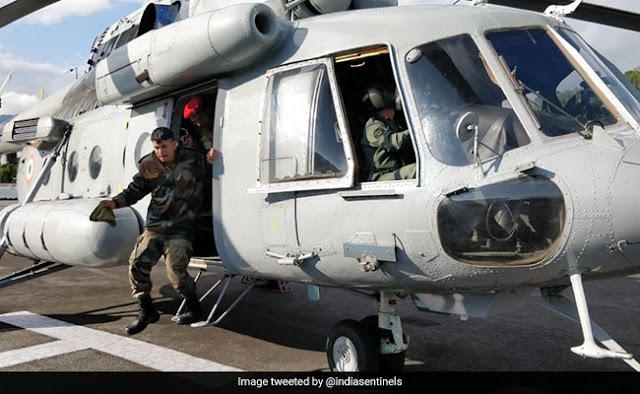 Over 80 people, including tourists, who were stranded in North Sikkim due to incessant rains and landslides, were airlifted by the armed forces Monday, district administration officials said.